Woodbridge Town Hall is located at 1 Main Street, Woodbridge NJ 07095; phone: 732-634-4500. Photo: Jonathan Dunham House, ca. 1700, 650 Rahway Avenue, Woodbridge, NJ. Listed on the National Register of Historic Places in 2004. Photographed by Summersleek (own work), 2011, [cc0-by-1.0 (creativecommons.org/publicdomain/zero/1.0/deed.en], via Wikimedia Commons, accessed October, 2012. Woodbridge is one of the oldest towns in Middlesex, situated almost immediately north of Perth Amboy, and the township in which it lies was chartered June 1, 1669. Its settlers were mostly descendants of the Pilgrims, and from one of their number, the Rev. John Woodbridge, of Newbury, Massachusetts, the village derived its name. The grant privileged the inhabitants, among other things, to choose their own magistrates and ministers, authorized a court of judicature, guaranteed liberty of conscience "according to the terms of the concessions," and stipulated that the inhabitants should have "the privilege of a free trade, unburdened by any excise or tax save such as may be imposed by the government and general assembly for defraying public charges." Lots were drawn for May 8, 1717, under the supervision of John Parker, and Caleb Campbell was permitted to draw a lot in consideration of his wife having been the first Christian child born in Woodbridge. June 24, 1769, a royal charter was issued incorporating the free schools of Woodbridge. However, schools had been previously existent, James Fullerton being mentioned as schoolmaster in 1689. John Brown, of Amboy, was engaged to teach a free school in 1694, but it is uncertain whether he actually served, protest having been made against his appointment, and a few months later John Backer (or Baker) was employed. From this time, however, schools were maintained almost constantly. The history of religion in the community begins in 1669, when the Presbyterians prepared for the formation of a society, but a meeting house was not completed until 1675. The first minister was the Rev. Samuel Treat, in 1670. In 1680 the Rev. John Allen entered upon his duties as the formally inducted town minister. At a later day the Rev. Archibald Riddell was the pastor. In 1689 he set sail for England, but when near his destined port his vessel was captured by a French man-of-war, and he, with a ten-year old son, was sent to France, where they were imprisoned for two years, and were finally exchanged and allowed to go to Scotland. 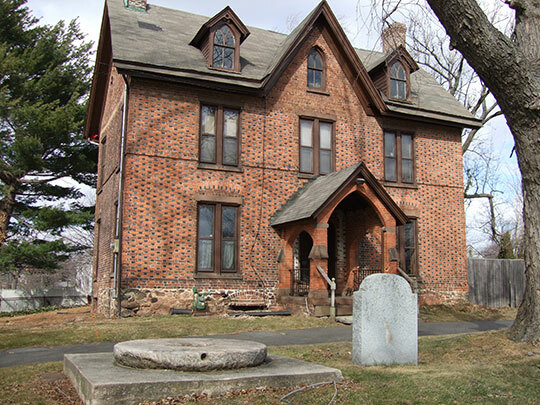 The Woodbridge Church established a cemetery, which is said to be one of the oldest burying grounds in the State. The Rev. Mr. Dalley, prior to 1882, estimated that the grounds contained two thousand graves, and Dr. H. R. Stiles printed a list of twelve hundred inscriptions upon stones covering them. The church yet exists and is in prosperous condition. The Quakers were numerous from the earliest days, and there is record of a meeting of members of this sect August 3, 1686, and there is evidence of a meeting house and burial place in 1705. These people established a small circulating library for their own use. The society finally abandoned its organization, and in 1784 its property, including the burying ground, passed into the possession of the Methodists. Trinity Church (Protestant Episcopal) was formed in 1711 by a number of persons who separated themselves from the Presbyterian Church. A small house of worship was built, but it was never completed and eventually went to ruin. In 1754 another church was built, but services were held irregularly, or by ministers who also served other congregations, until subsequent to 1830. The building was repaired in 1842; it was burned down in 1858; and in 1860 it was replaced by a large and substantial edifice, which was dedicated by Bishop Odenheimer, May 20, 1861. The Methodist Episcopal Church dates its organization prior to 1820. For some years the congregation worshipped in the meeting house purchased from the Quakers. In 1870 the present commodious edifice was erected, at a cost of $23,000. Churches of later date are St. James the Minor Roman Catholic Church, which erected a building in 1867, and the First Congregational Church, which was organized in 1874 and which built a house of worship the following year. The older history of Woodbridge presents many points of deep interest to the antiquarian and student of history. Here, in 1751, James Parker set up the first permanent printing press in the province of Jersey, as narrated at greater length in the "Chapter of Literary History" in this work. This same James Parker, as comptroller, acting under the direction of Benjamin Franklin, in January, 1764, established a mail between New York and Philadelphia to be carried by a post-rider on alternate days. This was before the introduction of postage stamps, and the charges were collected by the post-rider, and were graduated on a basis of the distance of carriage. Copper was mined in the vicinity about 1786, and at intervals in succeeding years. George Washington tarried in the village, at the Cross and Key Tavern, April 22, 1789, while traveling to New York to his inauguration as President of the United States, and Lafayette was entertained by the citizens. September 24, 1824, when visiting the United States as the guest of the nation. The Woodbridge of the present day is a beautiful residential village, having in 1900, a population of two thousand, and is governed as a borough of the second class. Four firms, employing nearly three hundred people, are engaged in the manufacture of fire brick. Schools and churches are liberally maintained. The Barron Library is a monument to the generosity and intelligent public spirit of Thomas Barron, who at his death left a bequest of $50,000 for its establishment. It stands upon ground which was a part of the old Barron homestead, and the cost of building was nearly $18,000. It was completed in 1877 and was formally opened to the public on September 11 of the same year. The library originally contained some three thousand selected volumes, and this number has been materially increased from year to year. The reading rooms are supplied with the leading current magazines and newspapers. Mr. Barron was a native of Woodbridge, born June 10, 1790, and he died August 31, 1875. He amassed a competence in business life as a merchant in New York, his trade relations extending to Liverpool, London and the West Indies. He was of scholarly tastes, and was a member of the New Jersey Historical Society and for several years its corresponding secretary. He was also a member of the New York Historical Society, a fellow of the American Geographical Society and a fellow of the American Museum of Natural History. He contributed liberally to the Sanitary Commission during the Civil war period, and in his will he made munificent bequests to various benevolent and scientific societies.